How do you find the version number? On any other software program you go to the About, usually under Help and you can see what version is installed. NOT so with the Geocaching app. Where is the version installed number hidden? On mine, it's at the bottom of "Help and About", in both Android and IOS. I am guessing this is the screen? I have looked here before and I am not seeing it. Interesting, it should be showing the version number in the bottom left there. I'll look into that. In my copy of the app, the version is in extremely light gray font on a white background. If you look at the screenshot posted by hofy67 carefully, there are a few not-quite-white pixels at the bottom, where the version should be. Maybe the font isn't just nearly illegible for hofy67. Maybe the font is nearly invisible (and completely illegible) for hofy67. To the OP, can you scroll up more on your Help & About screen? That's it! Looks like you can set your display to pretty much make the “version” info vanish. The "Version" is set in an impossibly light gray, called “Groundspeak Dim”. 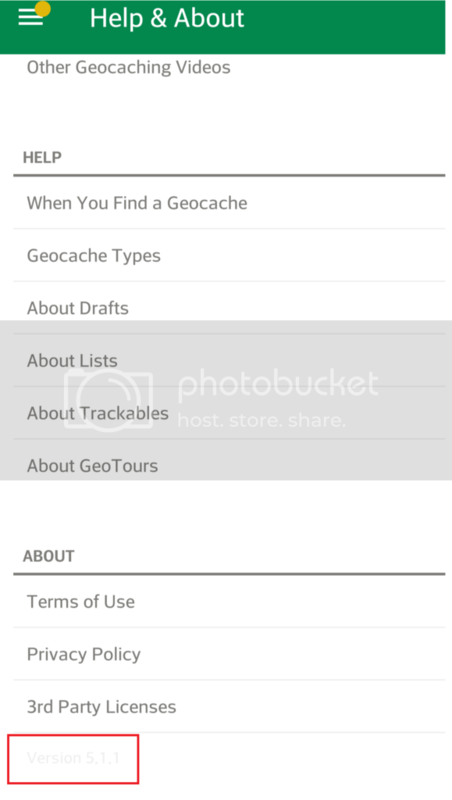 Since the universal web standard has a priority of readability over artistic flair, yet to be the company on the cutting edge of un-readability, it is Geocaching.com's type style of choice and used at random in the App and extensively on the site. It was sold to TPTB by traveling minstrels for a large chest of gold, as text that “only the most intelligent can see”. Using the Settings->Apps->Geocaching I am able to see what version is installed. the screen captures that the others have shown I can faintly make out that there is something there but since it is almost white on white I can not make it out. Why is it hidden?